As curious as I am about Vietnamese restaurants located outside of major ethnic enclaves, I rarely visit them out of fear of being disappointed. Even though St. Louis is home to a large refugee community, I’ve avoided exploring the Vietnamese establishments in the city during my last couple of visits due to my big city leanings and Midwest prejudices. Growing up on my ba ngoai‘s fabulous home cooking and living abroad in Vietnam, I’ve developed an admittedly snotty attitude toward the cuisine. 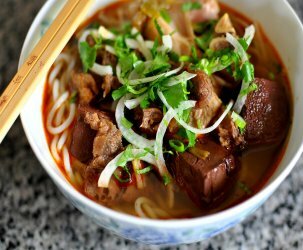 In my mind, there’s a right way to do things in the Vietnamese kitchen, and as a result, I have avoided eating in places that might compromise my notions of properness. A mouthwatering spread on banh mi sandwiches in the January issue of Sauce Magazine, St. Louis’ monthly food-focused publication, convinced me to reconsider my policy. The vivid photos and sharp writing painted an exciting picture. As far as I could tell, the humble banh mi was taking over the city and I had to have a taste—authenticity be damned. 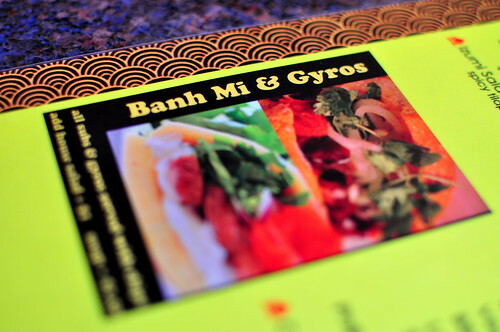 The majority of the banh mi shops featured in the article were located on or near Grand Avenue in South City. However, due to time constraints and lack of wheels, The Astronomer and I visited BBC Asian Bar and Cafe in the Central West End. 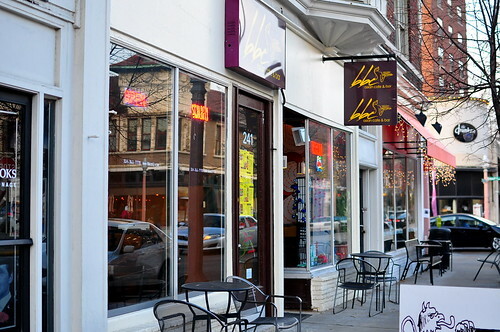 The Korean-owned restaurant was formerly called BBC Banh Mi, Boba Tea & Crêperie. Both of our sandwiches were served with snack-sized bags of Doritos. I thought the side item was a bit strange, but somehow fitting of our environs. 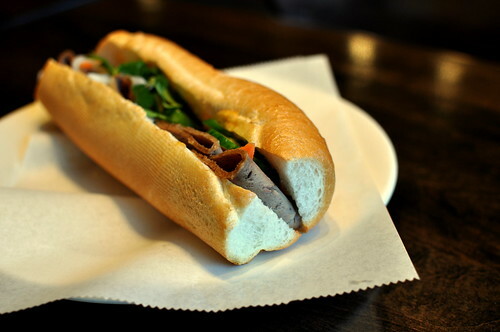 Based on Sauce‘s recommendation, we ordered the lamb banh mi ($5.50). One of the more noteworthy local variants of the banh mi graces the menu at BBC Asian Cafe & Bar in the Central West End. There, lamb inspires wolfish gusto over an exceptionally well-balanced, if amusingly messy, sandwich. I was initially weary of fusing Greek gyro meat with traditional banh mi fixins, but the combination turned out to be a treat of Zeus-like proportions! I was most impressed with the baguette, which was light, warm, crispy, and the ideal thickness. Additionally, the chili infused mayo gave the sandwich an edge unlike any banh mi I have ever tasted. We also ordered a good ‘ol banh mi dac biet ($4.95) to see how it stacked up. The sandwich contained slices of head cheese, ham, and cha lua (pork loaf), along with the usual mayonnaise, pate, pickled vegetables, cucumbers, chilies, and cilantro. I appreciated that the pate, cha lua, and head cheese were served in all their funky glory, not watered down one bit. The sandwich’s ingredients melded together impressively, save for the deli counter ham. After such a positive Midwestern banh mi experience, I am convinced that it’s only a matter of time before the-little-Vietnamese-sandwich-that-could goes totally global. Catherine, now I’m convinced that you could find a banh mi sandwich shop just about anywhere – even on Antarctica. These look incredible. My lunch plans were up in the air today, but now there’s no question what I’m having. A few years ago, my wife and I were visiting family in Nebraska and were looking for a place to have lunch that didn’t scream “You’re in the Midwest!” I couldn’t believe my eyes when we saw a Pho house. Lunch was incredible and I was so happy. I later found out that there are quite a few Vietnamese restaurants in Lincoln. It was then that I told her that I would have no problem living there (if we absolutely had to). Give me a town that loves college football and even average Pho and I’m in. Yummy! I’m going to venture out of work for lunch today and get me a Banh Mi. I’ve been craving it for a while and your pictures have pushed me over the edge into “must have one NOW!” territory. Dang, remind me to NEVER ever attempt to cook you a Vietnamese meal! 😉 I’ll keep all forays into pho territory to myself. So maybe after you de-phower me, we could attack banh mi next? Just as long as there isn’t any funky head cheese involved. Hey! how’d you get a copy of Sauce Magazine? 🙂 After reading Sauce Mag, I really wish we could start a version in LA. Wouldn’t that be awesome? I’m going to St. Louis in May! We Viet, we’re small and travel well. Thus, we’re far-reaching! Whoa!!!! 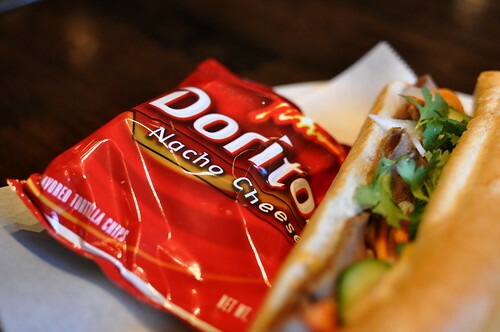 This is the gyro – bahn mi you were telling me about. Crazy – I never thought these two sammies would merge. My brother shoulda had these at his wedding (married a Viet gal). I’m glad you sought this place out…if I ever go to St. Louis this will be my first stop. 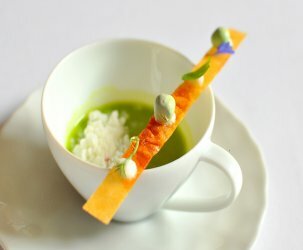 Good work Gastronomer!!! Yes, we do have a Banh Mi chain here in Malaysia! Quite recently I might add. 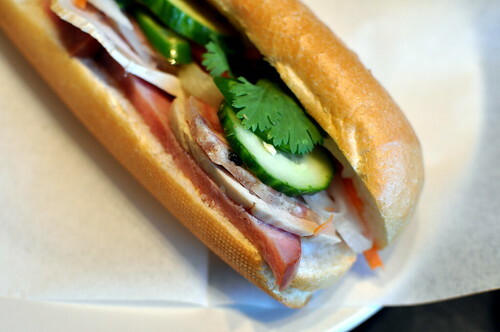 Do the Banh Mi in Lowell, MA at Hong Cuc Sandwich Shop on 507 Dutton St. The best Banh Mi in the region for $2.50! 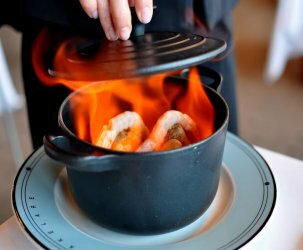 don’t get me wrong, I love your opinions as much as anyone, but I don’t think there is a right way to prepare food. maybe a way that came first, or experiences we had previously had which set our ideas or palates in stone. if we cling to the view that the best or right way is this or that, then the excitement to experiment or explore by chefs will bee significantly extinguished. it’s all a matter of taste. personal taste. which we all take personally. but, hopefully, not too seriously to dampen what may come in the future. CP – Did you not read the post? I ate a gyro banh mi and said, “authenticity be damned.” Chill, brother. chuc mung nam moi! i want me a Lee’s sandwich, yea i said, lee’s! thank goodness i live in the middle of little saigon. but the streets are jammed pack to the max with all the tet activities going on around town. Just went. It SUCKED. The service was HORRIBLE. We were never asked for drinks so we had to hunt down the waiters that stood in the back room. We were charged for water, our hookah was broken, and when we asked for it to be fixed, were told we would be charged an extra 5 dollars. We asked for the manager and the waiter lied and said he was one, asked us if we had a problem, then walked away without us getting a word out. We found the actual manager, and after calmly explaining that the hookah was broken when we got it, she asked us to leave and never come back. We asked why and she refilled our hookah for free and gave us the waters free. WHHAAAA??? BI-polar. For real. Never going back.